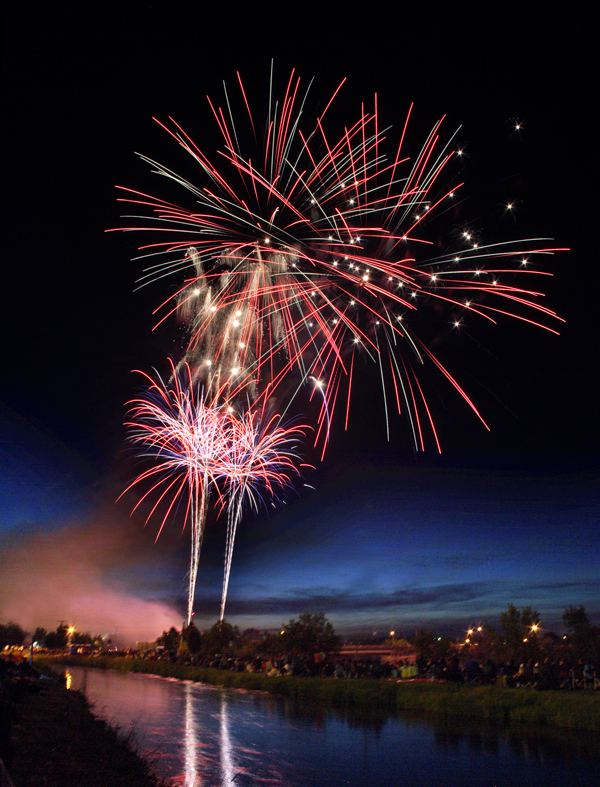 Fireworks over the Snake River at the 2012 Melaleuca Freedom Celebration. Hard to believe, but the Fourth of July is one month away. As usual, Idaho Falls offers a lot on Independence Day. Nothing as extraordinary as a dog fighting a badger, which actually was offered as entertainment in the 1920s (I wrote the Post Register's "Looking Back" column for 12 years, so I know these things), but nevertheless there's good, wholesome fun for people of all ages. The Military Affairs Committee will start the day with the Firekracker 5K Fun Run, 7 a.m. at Tautphaus Park. Registration forms can be found at Firekracker 5k. Will the race be more fun than ever now that they're spelling its name with a "k"? I kan't wait to find out, but I need to do some serious roadwork in the next month if I hope to finish at all. Once the run is over, South Boulevard will be cleared for the State of Idaho's largest Fourth of July parade. Beginning in the Idaho Falls High School parking lot, the route goes down Fourth Street, left on South Boulevard and all the way to Tautphaus Park. At 9 a.m., classic cars and Idaho Falls Police Department will start the parade, the theme of which this year is "Pride in Patriotism.” There are more than 100 floats signed up, and more 50,000 people are expected to line the route. This year's theme: "Stay True to the Red, White and Blue." Click HERE for Parade Rules & Guidelines. The Liberty Festival on the Falls bridges the gap between the parade in the morning and the fireworks in the evening. Sponsored by Snake River Landing, Eastern Idaho Regional Medical Center, Apple Athletic Club and Melaleuca, the festivities will be located on Memorial Drive between Broadway and E Street in beautiful downtown Idaho Falls. Over 20 food vendors and 50 businesses, which include arts and crafts vendors, will showcase their products and services during the festival. Fair-like games and activities will amuse the whole family. There will be pie and watermelon eating contests for children and adults. Children will enjoy the inflatable jumpers which will entertain them for hours. And finally, it wouldn’t be a festival without live music by local bands: Desert Harmony, Happyville, The Galaxy Forest and the Affection Collection. 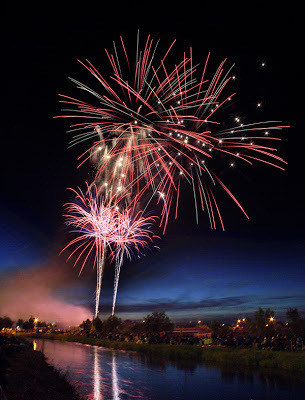 In the evening at 10 of course comes the big show, the fireworks display, the Melaleuca Freedom Celebration, one of the most spectacular fireworks displays west of the Mississippi. which draws tens to thousands of people to town. Find your favorite spot early. Here's the Web page if you want to read about it: Melaleuca Freedom Celebration.